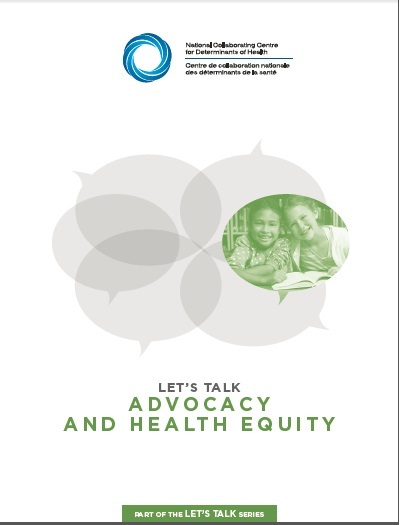 The sixth release in our “Let’s Talk” series highlights the importance of advocacy as a strategy and practice within public health, and describes the different ways advocacy can contribute to addressing the social determinants of health and improving health equity. It acknowledges the challenge of engaging in advocacy within the Canadian public health context and provides a framework for situating a variety of approaches and resources that could be of help to public health practitioners in their particular context. The case is made for shifting the advocacy focus in public health from individuals and groups to upstream policy and structural changes. The resource includes discussion questions to help public health staff examine their work and consider whether they have the skills to participate in advocacy, how they can create safe spaces to engage in advocacy, and how to address policy and social change at the structural level. National Collaborating Centre for Determinants of Health. (2015). Let’s talk…Advocacy for health equity. Antigonish, NS: National Collaborating Centre for Determinants of Health, St. Francis Xavier University.